I was so excited to learn that I’d been chosen as a member of the Sisterhood of the World Bloggers group by my friend and colleague, Alison Abbott of Green with Renvy. I met Alison in April in Barcelona, Spain, right before the TBEX conference that we were both attending in Costa Brava. Alison is from Boston, and being a former New Englander myself, we hit it off immediately and spent as much time together as possible during the next week. Oh, the laughs we had with my selfie stick! Alison’s blog is the perfect intersection of fun, food, and sustainability – make sure you check it out! 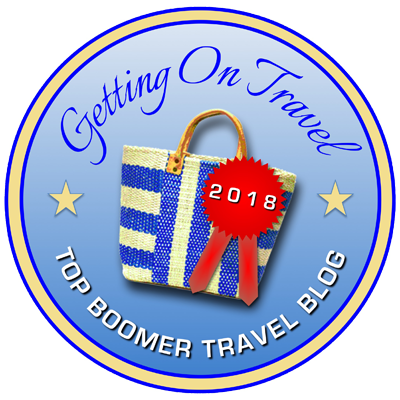 Becoming a member of the Sisterhood involves answering ten questions from the person that nominated you (in my case, Alison), and passing the award along to 10 additional women bloggers who focus on travel. The best part is you get to ask them your own questions! It’s a great way to get to know some of the amazing, inspiring female travel bloggers! And the fun starts…now. GO! If you could sit next to anyone (dead or alive) on a one hour flight, who would it be and why? What is one destination you would like to get to and why will you probably never get there? Tell us about your carry on – what is always in it? What is unique about your travel blog? Do you have a guilty pleasure when you travel? Favorite city and what do you like to eat there? Could you give us a photo? What is the first thing you do when you arrive in a new destination? Do you collect any particular item or souvenir when you travel? “Life began with waking up and loving my mother’s face.” (George Eliot) I would love to have even one more hour with my sweet mother, the most wonderful person God ever made. She passed away at age 62, way too early, after a 25-year battle with breast cancer. How do you thank someone who held the ladder so I could reach the very stars? She was the most kind, supportive, generous, non-judgmental person I have ever known or loved. I’d like to explore the Middle East, but a blonde American in that area of the world? Um, no. I like to eat local, especially street food; I hang my towels and reuse them. I never travel without my laptop and the power cord. I tried using an iPad, but it was just too inferior. To be efficient as a travel writer/blogger, I need instant access to my saved files, research, and photos. I am an adrenaline junkie! If I were 25, I’d be in good company. But I don’t find many baby boomer women who think jumping out of airplanes or swimming with sharks sound like the kind of thing they’d like to do. They do, however, like reading about my adventures, so this is my niche. Oh, good grief, yes! Ice cream. I feel compelled to try the ice cream at every destination. Six scoops is my record, and so far, no one can beat that – at least not in a photo. Whatever one is about the destination that I’m currently traveling to. J I also just started reading Wild Life: Travel Adventures of a Worldly Woman by Lisa Alpine which seems to be right up my alley. That’s like asking me which of my children I love the best! There are so many international cities I love, depending on my mood and what I’m looking to do. Italy and Thailand have overall the best food, but I’m going to backtrack…. Key Lime pie and cannoli’s are my favorite “foods” in all the world, so I’ll have to go with two cities in my own country that have the best: Key West and Boston! Dump my bags in my room and immediately go out and investigate the area surrounding my hotel! My preference is to stay at “value luxury” boutique hotels that are unique (and can be a little quirky) that are right in the middle of everything, walking distance to cafes, restaurants, shops, etc. I have to be honest, while it’s nice to be pampered, I really don’t like high-end resorts that are secluded far away from the lifeblood of the destination. Those places insulate you from feeling the real vibe of a location. I like walker-friendly cities. I usually look for unique, locally made, dangly earrings for me and my daughter, and a cool T-shirt for my son – he has quite an international collection by now! And here are the 10 women that I think should get the award. What is your favorite thing to write about? History, spas, food & wine, adventure, something else? What has been your most fun travel experience? What kind of photographic opportunities do you look for? What is your pet peeve within the travel blogger world? For example, I could literally pull my own hair out whenever I hear the term “authentic travel” used in a condescending way. What’s the #1 place on your bucket list? Is there one place that you would never consider going to/going back to, and why? What do you like best about travel blogging? What do you like least about travel blogging? What is your preferred method of travel – group press trips, self-guided press trips, slow travel, solo travel, backpacking, etc. – and why? Stop by their great blogs – I’m always inspired, and I know you will be too! Filed under Fascinating Women, Girls Getaways. Tagged Luggage and Lipstick, Patti Morrow, Sisterhood of the World Bloggers. Thank you so much – I’m thrilled to see my name here! Of course, Kay! Your blog is fun — love it! Am I supposed to answer the questions? Blonde confusion….. Yes, I believe you’re supposed to create a blog post with the questions, list your 10 for the award and create your own questions.